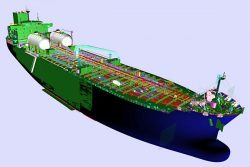 Lloyd’s Register (LR) has presented South Korean shipbuilding company STX with approval in principle (AiP) for a 50k dwt MR (medium range) tanker design capable of using Liquefied Natural Gas (LNG) as a fuel. This development is the result of close collaboration between STX and LR. The AiP was presented to STX by Young-Doo Kim, LR’s North Asia Technical Support Office Manager.